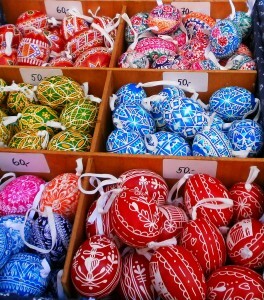 This weekend has been full of colourful celebrations in Prague for Easter, with places like the Old Town Square occupied by market stalls selling painted eggs and braided willow twigs as part of the traditional Czech Easter celebrations, but Easter here in the Czech Republic has its origins in darker times, with many of these traditions rooted in pagan, rather than Christian customs. In Slavic cultures such as the Czech Republic (it’s believed the Slavs first migrated here and mingled with the Boii, the Celtic inhabitants of the Czech lands in the 7th century AD, for more information on the pagan origins of Prague, you can always try our Prague Castle After Dark tour), the month of April marked the beginning of the new year, the end of winter and the start of spring. 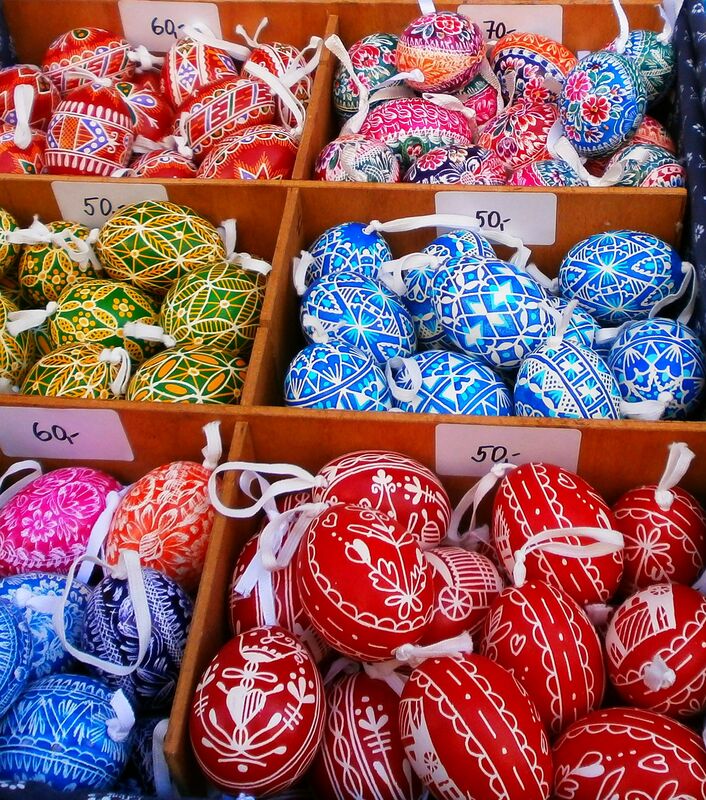 In old Slavic the last night of the year was known as Velja Noc, or ‘The Great Night’, and indeed Easter today is still called ‘Velikonoce’ in Czech, or ‘The Great Nights’, referring to the Easter weekend but coming from the same linguistic root. The original Velikonoce celebration was actually similar to Halloween in pagan Britain, when it was believed the barriers between the worlds were at their weakest and spirits could roam freely between their realm and ours. In pagan times, it’s believed the shaman of the tribe or village would have paraded around the settlement in a grotesque mask, sometimes with the villagers joining in, to scare away any evil spirits who might have strayed into the mortal world, similar to the practices in Celtic countries like Britain and Ireland around Halloween, which eventually developed into our modern ‘trick or treating’. It was also believed that on the Great Night, the spirits of the ancestors would also roam around the country, visiting the houses of their living descendants, and celebrating the New Year with them. The Slavs also celebrated a spring festival, dedicated to the god of vegetation and fertility, Jarilo (Czech for ‘Spring’ is jaro, from the same root). It’s believed that eggs were decorated at this time and given as gifts to ensure fertility and good fortune, as the egg was a symbol of new life. The people of the villages would often form a procession, going from house to house, carrying branches as symbols of growth and life, and would recite blessings at each household, to ensure good luck and fertility throughout the coming year. Again you can see echoes of these old traditions today, not just in the countless decorated eggs available to buy on the market places, but also in the tradition of the pomlazka, these braided willow rods you might see people carrying at this time of year or on sale at the markets, which young men and boys traditionally carry around, going from house to house reciting Easter carols, and often receiving a painted egg as a reward. Later, as April comes to a close, there is another festival, still observed today in the Czech Republic, which also owes its origins to the pagans, but possibly originates more from the Celtic Boii than the Slavs – the 30th April is ‘Pálení čarodějnic’ or ‘The Burning of the Witches’, and corresponds to the Celtic festival of Beltane, the celebration of the spring equinox, or the Germanic Walpurgis Night. Like Velikonoce, this day was thought to be a time when magic was at large, and witches in particular could be at their most powerful. To protect themselves from any evil influences, people burned effigies of witches on bonfires, and the tradition continues to this day. Any demons or evil spells are thought to go up in smoke along with the witches. 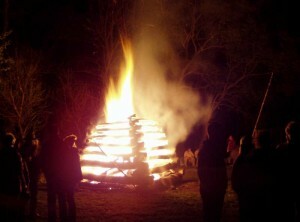 In some places, the ashes from these bonfires were collected and sprinkled in pastures and fields, especially if there were cattle grazing there, to ensure fertility for the coming year, or else cattle would be brought to the bonfire and made to jump over it (presumably a smaller version of the fire would be used than the huge pyres that tend to be seen nowadays!) again as a fertility ritual. So April is a magical month for the Czech Republic, and perhaps a good time to take a ghost tour, just in case some of these demons or witches have decided to cross over, now that the barriers between worlds are thin. Certainly our Underground Walk has been very active this month in terms of strange phenomenon and unexplained photographs. 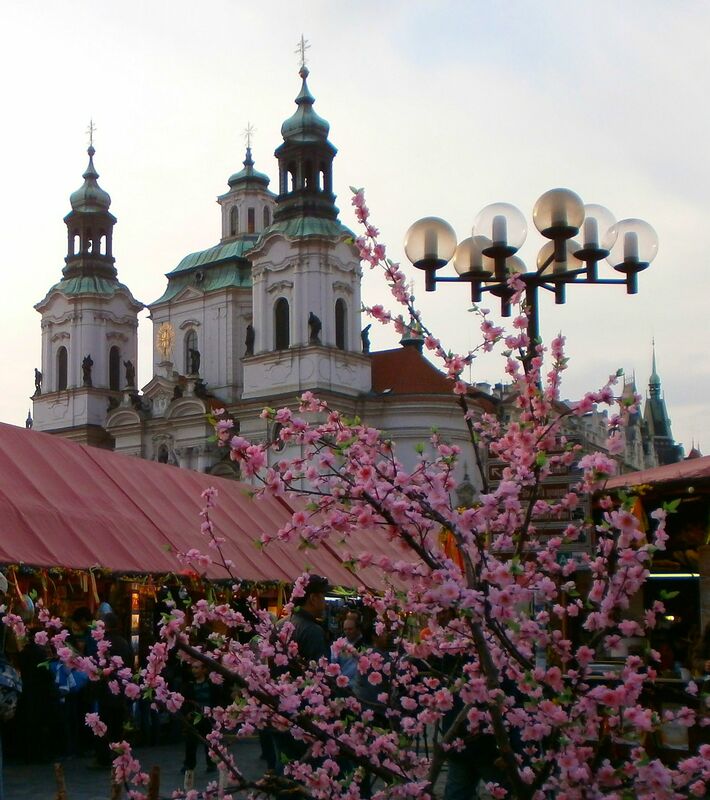 If you take our Prague Castle After Dark tour, you’ll be walking over the sight of the old pagan settlement where these rituals would once have been very seriously observed, or perhaps you could head to the top of the Old Town Bridge Tower, look out over night-time Prague and see if you can sense the magic in the air? However you choose to celebrate this special month, we at McGee’s Ghost Tours would like to wish you Veselé Velikonoce!